It's the time of year when parents try to think of creative ways to make sure each child gets the same number of easter eggs, but I'm going to tell you the benefits of letting things be unfair. 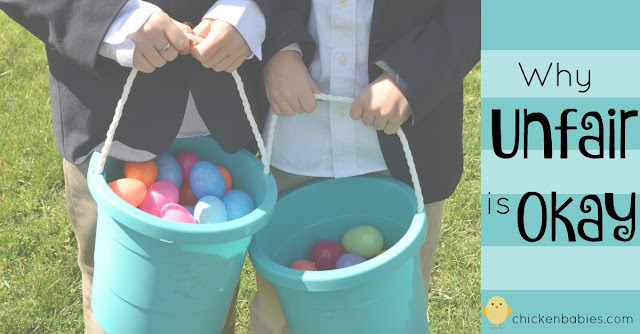 I first experienced a public Easter Egg hunt when my three kids were 5, 3, and 1. My husband was working but I thought I could handle it on my own. The hunt started at 10am at our local YMCA. I signed us up and packed the kids in the car. Little did I know (this being my first community easter egg hunt) that when they said the hunt was at 10 they did not mean everyone arrive at 10. They meant the whistle would be blown at 10! (Newbie mistake) Right as we pulled into the parking lot we heard the whistle blow and saw the kids scatter everywhere. My 5 year old daughter started freaking out and I thought "oh no, this is going to be a disaster!" as I imagined the fits I would endure the rest of the day since she missed the hunt. We hurried out of the car (as much as you can when you have 3 kids to get out of car seats) and ran over but with the 3 year old holding my hand and the 1 year old on my hip, I couldn't do much to run around and help her find any missed eggs. I turned to her to apologize and just then a little angel of a girl came up to Maren and handed her a couple of her Easter Eggs. Maren turned to me with her face beaming and said "mom! she shared with me!" My daughter didn't complain that she only got two eggs, or that we missed the hunt. She beamed the whole way home because a stranger saw that she didn't get any eggs and shared with her. 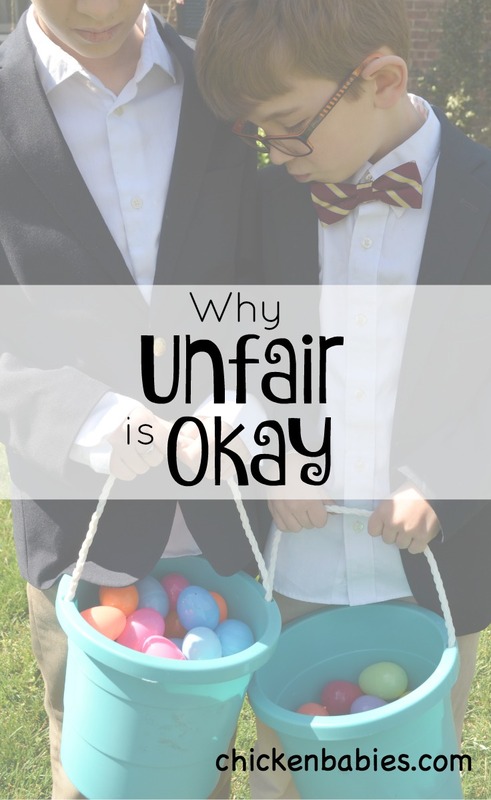 This experience changed how I feel about always making things fair for our kids. Our kids need the opportunity to see another's need and share. And it will make them happier. Now when we go to Easter egg hunts, I always remind my kids to look for someone who has fewer than they have. I don't make them share, but we talk about how they feel when someone shares with them, and how we feel when we share. They agree that they feel happy when this happens, but it's so hard to give away what you think is yours! If we start this when they are young, giving will become a habit. There's always the opportunity that someone will be selfish and greedy when you do egg hunts this way, but that's a trade off I'm okay with. These kids need to practice noticing others and their needs. And when they are looking out for people with less than them, they tend to be less jealous of those who have more. Today we had another neighborhood hunt. My older two children are now too old to participate, but the 9 year old and I went (the 6 year old was off with grandparents). I was so proud of Christopher as I watched him recognize a boy who joined the hunt late (his parents must have made the same mistake I did that first time!) and saw him give the boy 3 of his eggs. And when he ended up winning 2 stuffed animals, I proudly watched him find a little girl who was sad and give her one of them. There were definitely kids today who had more eggs than Christopher collected, but he didn't focus on that. He came over to me with a huge dimpled smile and proudly told me how he had shared his eggs. That to me is definitely worth things being "unfair"! What are your thoughts? Do you agree? How do you teach your kids to look out for others in need? I'd love to hear from you! Thanks for reading! If you enjoyed this post, you can follow me on Facebook, Pinterest, Twitter, and Instagram. Hello! My name is Erin. 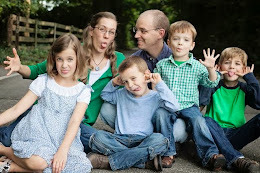 I'm a wife, mother, musician, writer, teacher, and all around crazy lady.